After yesterday’s huge update of Amped FIVE, today we have an even bulkier one for Amped Authenticate. The field of Forensic Image Authentication is really starting to move forward quickly, due to the increasing need to analyze images for evidence of tampering and malicious manipulation. To further support users of Amped Authenticate, a number of new filters and processing tools have been added to this unique and powerful software package. 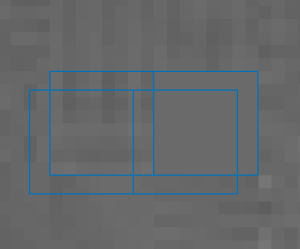 I will be going into detail on some of these filters in a future post but briefly, the JPEG Ghosts map is able to visualize blocks within a jpeg image that have undergone re-compression. 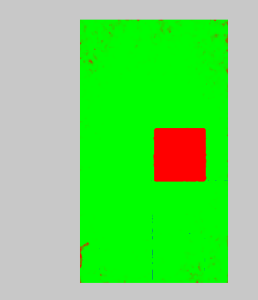 If an image, or part of an image, presents different compression consistency then those areas will be displayed in red. The ADJPEG and NADJPEG filters are also for detecting signs of re-compression. Only one of the filters may produce a required result, as obviously, an image will either be aligned or not aligned. 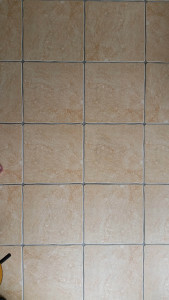 Alignment refers to the 8×8 pixel blocks that construct the jpeg image. If a new item has been copied into an image and the process has retained the original block structure then they will be aligned. If, not… well, they won’t be aligned. These are very powerful filters, when used in conjunction with other visual and metadata analysis. What part of the image do you think has undergone a different level of compression? Lastly in this section, the Fusion Map. This is a ‘Fusion’ of both ADJPEG, NADJPEG and then the JPEG Ghost Filter. In addition to this, the filter considers also information about the image itself, for example ignoring warnings on saturated areas (where the results are unreliable anyway) and adapting itself to read with different variance. Again, the filters are all run automatically and the resulting image displays the suspect areas. These new filters are just some of the results obtained thanks to the European Commission funded project “MAVEN“. OK, this is a big one! Under Tools, The Batch Processing option now has the ability to pre-process all filters, with all configurations and then automatically generate the report and save all output images. You also have many options to choose from, when deciding what to pre-process, what tools and filters to use and how you wish to output. The filters Panel now not only can be used to select a required process, it has been given a makeover in order for you to quickly see what filters have been processed and also display some warning signs on those filters that have produced suspect results. All the filters start off as standard text. When a filter has been processed, the details and results of this task will be cached. As a result the Filter name will turn bold. If a filter produces a result that is considered suspect, then it will turn bold and red. Take a look at my filters on the left. I can see immediately what filters I have processed and, more importantly, I can see the filter results I need to take a closer look at! Only some of the filters support the red warnings, since some of them absolutely need the interpretation of the analyst. Furthermore, a red label must not be considered dumbly as evidence of tampering, but just a hint for the analyst for double check them as something looks suspicious. The ability to search through a folder of images and conduct format analysis and comparisons on the images contained is a real help when starting to investigate a large amount of images. There are many cameras that now include their serial number in the images metadata. This field has now been included in the batch analysis process in order to quickly visualize any differences. 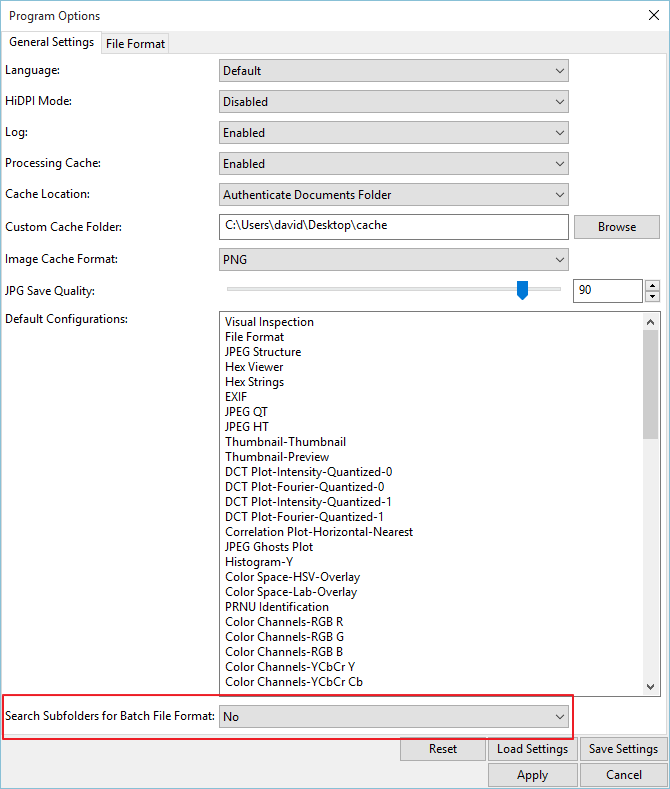 Finally, in Program Options, you can now select whether to also conduct batch file format analysis and comparison on sub-folders. This entry was posted in Announcements, Authenticate, New features on September 17, 2015 by David Spreadborough.